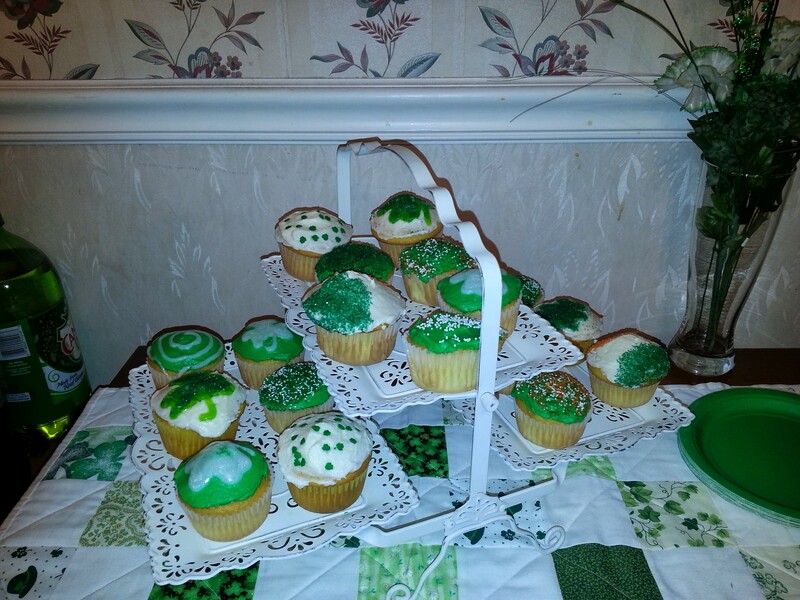 This past Saturday we had a small St. Patrick’s Day party. My hope as Saturday approached was that I could pull the party off for a reasonable amount of money. Typically, when I’m shopping for party groceries and supplies, my desire for the party to be a hit overpowers reason and frugality, and the closer the party draws, the more irrational I get. My husband is the same way. So we end up making last-minute trips to the grocery store because suddenly the food we bought doesn’t seem like enough or the right thing. Or trips to Home Depot for supplies to make repairs because the state of our house is suddenly embarrassing. And at the very last minute, he always freaks on me because we don’t have enough balloons. The man is obsessed with balloons. This time was going to be different. I was going to make all the food from scratch, and ahead of time where possible, so I wouldn’t be wasting money on prepared foods. I was going to graciously accept people’s offers to bring stuff, instead of being a control freak. I was not going to step foot in a party store because I knew I had at least one big box full of St. Pat’s décor and props in the basement, from the last such party. I was going to be realistic and accurate in my ideas of who was coming and what they would eat, and I was NOT going to have lots of wasted food. I was going to avoid paper plates and the like, so that I wouldn’t be creating waste. The first thing to go was the idea that I would make all the food. Hot roast beef and potato salad from a local deli sounded much more reasonable. Fair enough. You know how I feel about cooking. In the end, I bought too much, but it was tasty, and we diligently ate the leftovers on Sunday… and Monday. Using a cake mix, but homemade frosting. 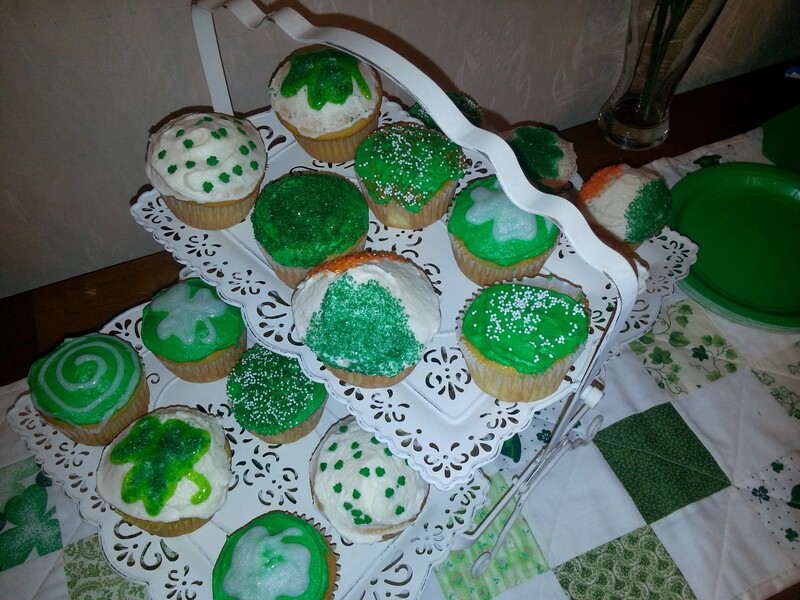 (I also planned to make Irish potatoes, but ran out of time. I made them Sunday instead. You know how sometimes the act of making something yourself makes you not want to eat it? You don’t really think about what’s in an Irish potato until you make them. Next time I’ll just sprinkle some cinnamon in a container of cream cheese frosting and go to town. Bleah. I don’t even really like coconut. I did manage to stay out of the party store. We had fun with all our old props, plus my mom brought some more. The kids loved all the beads and headbands and are still playing with them. 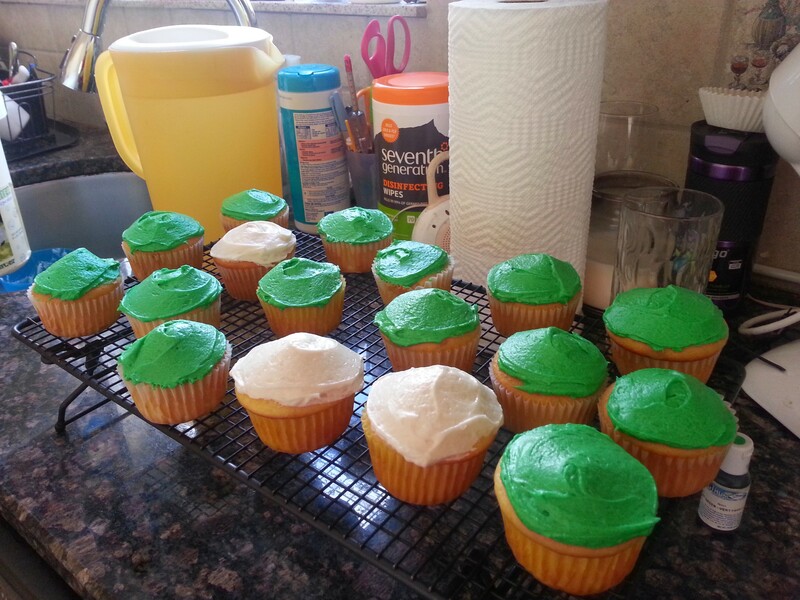 I used paper plates and napkins leftover from the last party, but I did buy green plastic cups. The last obstacle was my trip to Target on Friday for snacks, appetizers, drinks, etc. More and more, going to Target is like running a gauntlet. I need to keep my head down, stick to my list, and get out as soon as possible. Unfortunately, my husband wanted to come with me. This was bad because he views Target as a magical wonderland full of special things that will fulfill all his needs and desires. He’s entitled to feel that way, I guess, because he doesn’t go there all the time the way I do. Shopping is a rare event for him. A full set of kitchen knives (butcher, etc.). A set of drinking glasses. I could have argued over the wisdom of these purchases, but I just made him pay for them with his own money (we have separate bank accounts). I ended up spending around $65 on party food at Target, and just about all of that was stuff we could eat after the party too. My biggest mistake was probably buying produce at Target — it seemed expensive. Add in $60 worth of booze, and the grand total for the party was about $200. Could I have saved money by making the food myself? I guess maybe we’ll find out next time. I broke the Compact by buying a new lampshade. 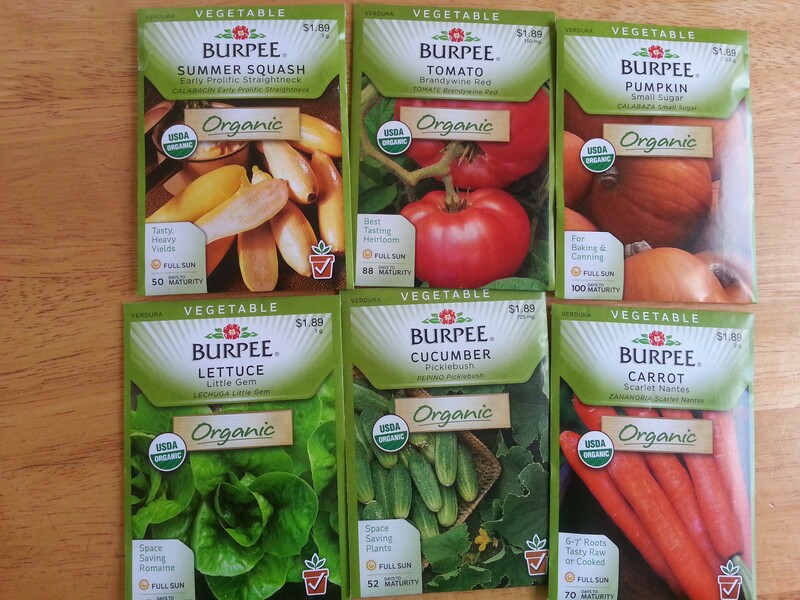 But I bought seed packets. Summer squash, tomatoes, sugar pumpkins, lettuce, cucumbers, and carrots — the 2014 garden!